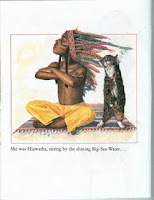 In several places on American Indians in Children's Literature and in my writing, I reference resolutions of the American Sociological Association and the American Psychological Association. Both associations, in their resolutions, call for the end of use of Native imagery in sports mascots. The resolutions are based on research studies that document the harm caused by this sort of imagery. Shown here are some characters in children's books. See the similarities? One of the people doing the research on effect of these images is Stephanie Fryberg at the University of Arizona. She was on our campus yesterday giving a lecture wherein she presented some of her research findings. Its quite frightening. I'm not being alarmist or dramatic. Her research is compelling. There are consequences for all children exposed to stereotypical images of American Indians. If you'd like a copy of her most recent publication, write to me and I'll send it to you. It appeared in BASIC AND APPLIED SOCIAL PSYCHOLOGY in 2008, and is titled "Of Warrior Chiefs and Indian Princesses: The Psychological Consequences of American Indian Mascots," by Stephanie Fryberg, Hazel Rose Markus, Daphna Oyserman and Joseph M. Stone. In the study, they showed high school students images of Pocahontas, Chief Wahoo, posters from the American Indian College Fund that say "have you seen a real Indian," and, statements reflecting negative stereotypes of American Indians. They tested self esteem and efficacy (community worth) of Native and non-Native students. If you'd like me to send you the article, write to me at debreese at illinois dot edu. We actually had a serious discussion in one of my colleges classes about the effect of American Indian stereotypes, especially as mascots for sports teams. The agreement was reached that American Indian stereotypes have gone on for far too long and indeed risk the chance of having a negative impact. I also have been shown a website run by American Indians that discusses books they approve and books they do not approve of due to the portrayal of American Indians. I think American Indians, in literature and as mascots, are wrongly represented and something should be done to change that. 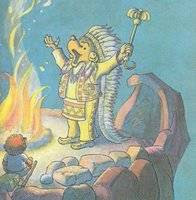 Hopefully, people will understand that American Indians are not the stereotype. This is all very interesting. Thanks for your input.